The Blackpool MAG Rally was a complete success this year with great weather and A new venue which went down a storm with the happy campers. Big thanks to Fleetwood Rugby Club and all the folk who came along to support this event which raises money for MAG's Fighting Fund. The Motorcycle Action Group Limited (MAG) held its 2015 Annual Group Conference (AGC) on Saturday 11th April 2015. The event was hosted in Bridgwater by the South West Region of the group. The 350 capacity hall was filled by members who listened to the reports of the last 12 months. There were two candidates for the chairman's role that is elected annually. The new chair is Selina Lavender, the previous Vice Chair. Selina said of her appointment: "I thank John Mitchell, the former chairman, for the work he has done over the past two years that has put MAG in the strong position it is today at the forefront of riders rights. His is a hard act to follow and I will give this role my all to keep the momentum going. 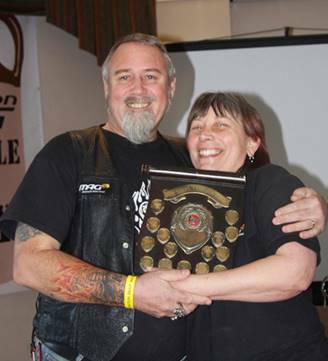 Salford MAG won the Richard Tegg Trophy, Blayz pictured here accepting the trophy from Selina. A very succesful NW AGM hosted at the Duke of York, Eccles, saw Tony Cox returned as NW Rep, Bill Green as Political Officer and Treasurer, Steve Blay as Clubs Officer and Dave Smart as Secretary. A full report will be available soon. 22/1/2015 Blackpool MAG Rally 2015 Tickets now on sale ! 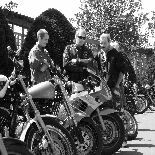 The NW AGM will be held at the Duke of York, Eccles M30 0EJ. The meeting will start at 1pm prompt and please bring your membership card to register. The Duke of York is the home of Salford MAG. Hot & cold drinks will be available and there will be entertainment provided after the meeting for those who can stay on and socialise. Manchester motorcyclists have applauded the work of local MP John Leech for his consistent and energetic efforts to stand up for their rights as road users in Greater Manchester. 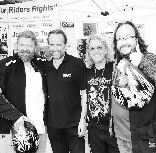 Mr Leech, MP for Manchester Withington and a member of the Motorcycle Action Group (MAG), attended the Manchester Ultimate Custom Show in Central Manchester to meet with key representatives of MAG. John has raised a number of issues on behalf of motorcyclists. These include concerns about the use of dangerous road dividers – called armadillos – which present a hazard to all road users, especially those on two wheels. 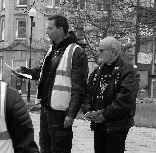 Mr Leech also held a meeting with veteran motorcycle campaigner – and constituent – James Torrance, to understand the issues facing riders in the area. Volunteers from NW MAG will be running the NW MAG stand at this years Ultimate Custom Show at Manchester Central 10th & 11th January 2015. The show takes on a different fornat this year including Trucks and Custom Cars. Hope to see you there! Once again, NW MAG have been asked to road Marshall the Hercules run. Anyone able to help, please contact the regional rep, Tony Cox on 07836-519391. If you would like to join the run, an application form can be downloaded HERE and by clicking the Hercules logo in the events column. We will be meeting at the Station Pub in Ashton Under Lyne for a ride around Manchester promoting "Riders Are Voters". Please download the flyer HERE and distribute. We need as big a turn-out as possible to create substantial news worthy item. 28/7/2013 Last of the patches and T-shirt/vests. Limited stock. MAG launched it’s Next Generation Raffle at the Into the Valley Rally this weekend in East Yorkshire. 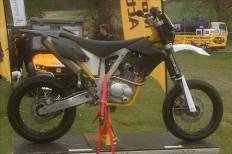 The main prize has been donated by AJP Motorcycles and is a brand new 125cc Super-Moto. Tickets will be available from your local MAG Rep or group meeting. 12/2/2013 Blackpool Birthday Bash Tickets now on sale !! NW MAG will be back at the Manchester G-MEX Show this year, so if you have any money left after the festive season and would like some MAG Goodies, want to renew yourmembership or just fancy a natter, pop by as there is plenty to discuss for the coming year!! 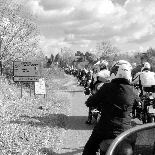 This years Hercules run will be leaving Preesall School, Nr Knot End at 9.00am on Sunday 7th October 2012 and heading towards the Barrow Dock Museum, Barrow-In Furness, Cumbria, taking in some fantastic roads in the 100 mile trip around the Lake District. The run will be raising money for the Trinity Hospice in Blackpool and the start of the fund raising capers kick off on the Friday night party at the Golden Ball, Pilling. Entry forms can be downloaded by clicking HERE MAG has once again been asked to marshal the event and we are looking for willing volunteers. 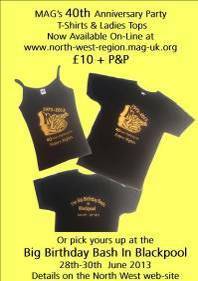 If you would like to help out, please e-mail Tony, the NW MAG Rep at north-west-rep@mag-uk.org or ring/txt on 07836-519391. Nextyear MAG will celebrate 40 years of fighting for “Riders Rights” on 28th June, which is the Friday night ofBlackpool MAG’s Rally. Plans are already being drawn up to makethis a party to remember so put it in your diaries for next year and comeand party at MAG’s 40th Birthday Bash in Blackpool ! Kev Hyde has taken over the running of Morecambe and Lancaster MAG. Meetings will be held on the second Wednesday of the month with the first meeting being held at the George Hotel, Torrisholme, on September 12th at 7.30pm. Come along and meet the Guys and Girls from the group. Atlong last the sun shone on the Fylde Coast for the 5th Blackpool Bike Show The show, now in it’s 6th year, took on a slightly different approach this year by charging all a couple of quid to park up in the picturesque Italian Gardens at Stanley Park, instead of just charging those who wanted to enter their bikes & trikes into the show. We also moved away from buying in the trophies and instead had them created by our very own Grobo. The outcome of these changes resulted in a gross profit just short of �350 which when combined with the small amount raised at Blackpool MAG Rally meant we could donate a cheque for �400 to this year’s chosen charity, the National Association for Bikers with a Disability, bringing freedom and independence to those who appreciate it more than most. Humongous thanks to those who displayed their machines and also to the hardworking MAG marshals who ran the event. 25/6/2012 MAG Rally wash-out destroy Marquees. Blackpool MAG's rally suffered some horrendous weather this year with gale force winds destroying tents and the rally marquees on the Friday afternoon. 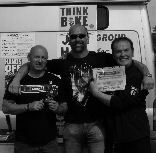 The hardy bikers that attended the rally still had a fantastic time and all was not lost. Final figures are yet to be counted but it is thought that we will have broke even or maybe made a few quid for the fighting fund. Big thanks to all who attended and especially to the marshalled who worked their socks of over the weekend. An eventful AGC held near Reading saw Den Powell elected as the new Chair for MAG. There were endorsements for Selina Lavender, Steve Wykes and Neil Liversidge as new Directors to the Board with Pete Walker and Jonathan Broad filling the other two vacant positions. Thanks were given to Paul Turner for his three years of hard work at the helm. A full set of minutes from the meeting will soon be available on from the MAG UK website. The NW MAG Stand will be open for business at the Manchester Bike Show this weekend at Event City, next to the Trafford Centre. If you fancy a really good day out, pop down and say hello. We are in Hall 2 on stand 261 with some superb bikes to view, including a Sprinter Chopper XL650, Hesketh V100 and Norton Rotary. 08/2/12 Motorcycle Alliance Party makes this weeks MCN. 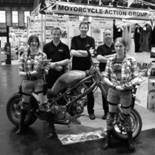 After no show in 2011, the Manchester National Bike Show was once again back at the Manchester Central (formerly G-Mex) Exhibition Centre. Favourable weather encouraged many to dust off their leathers, and the attendance on both the Saturday and Sunday was good. The presence of TT legend Guy Martin attracted many to the show, who was signing autographs and being his normal jovial self. The MAG stand was one of the main attractions as it hosted the latest creation of MAG member Grobo, his superbly crafted Sprinter Chop. The bike and slogan, 'Enjoy while you can, Europe wants to ban' stimulated lively discussion and plenty of new and renewed memberships were taken over the two day event. Many thanks to all who helped out at the show, which was Mag-tastic once again! 08/01/2012 Happy New Year to you all !! I hope you all had a pleasant festive season and look forward to working with you during 2012. If you are coming to the Manchester Central Motorcycle show next weekend please drop by the MAG stand situated in middle of the last row of stands next to the Live Action Zone. This year promises to be a challenging one for motorcycling in the UK and MAG needs as much assistance as possible defeating the proposed legislation that will severely curtail our hobby, passion, lifestyle, means of transport, business…pick any or all from the list. The NW AGM, held once again at the Charles Napier was well attended and prompted some interesting discussions. Tony Cox was re-elected as NW Rep, with Bill Green continuing as NW Political Officer. Phil McGladdery has taken on the role of NW Secretary, with Gillian Beautyman taking up the position of NW Treasurer. Many thanks to all who came along. The minutes are available on the Regional Reports page of this web-site. A new Morecambe & Lancaster MAG group is due to launch on Tuesday 15th November at the George Hotel, Torrisholme, LA4 6LY. 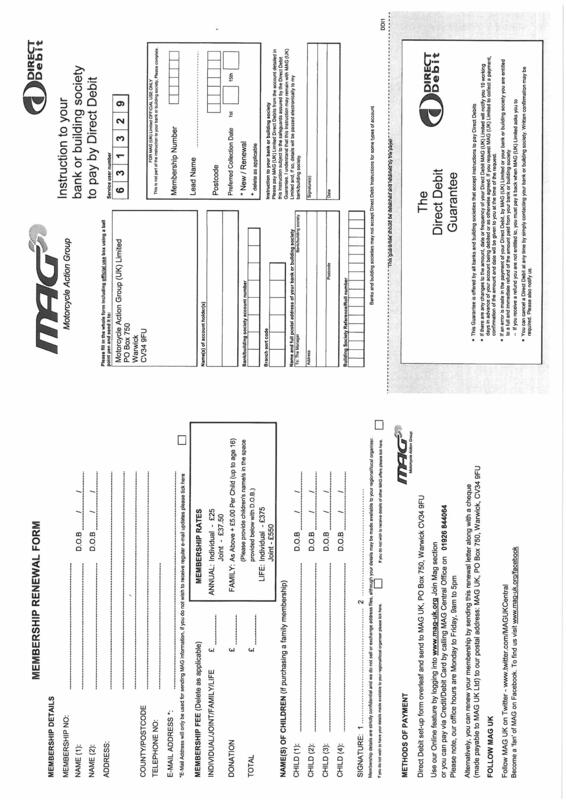 27/9/2011 Appeal for Marshals to help with the 10th Hercules Run. The 10th Annual Hercules Run leaves Fleetwood's Charity School, Mill St, Preesall.FY6 ONN< @ 9.30am, Sunday 2nd October, register from 8.00am. Anyone who is able to help out with the Road Marshalling of the event, please get in touch with Tony Cox, the NW rep on 07836519391 or email north-west-region-rep@mag-uk.org The organisers have promised free bacon butties to all Marshals this year, an offer to good to refuse! 26/9/2011 EU Demos a resounding success! An estimated 2000 bikes turned out to support the EU demos across the region. Feedback from the police indicates that they all went well and were conducted in a safe manner. Well done to all who took part and let's hope that the MEPs sit up and listen to our concerns. Even though the weather was poor at times, the atmosphere at this year’s rally was fantastic and all who were in attendance had a wonderful time, marshals included! A big thank you goes out to all involved in the organising and running of this year’s rally and for all who came and supported the event. Roll on next year, same time, same place !! �1 a ticket for a chance to win this 50cc two speed monkey bike, but you need to be at this year’s Fun n Frolics Rally for a chance to win. Past editions of MAG’s wonderful bi-monthly publication can now be viewed on-line by clicking the link below. If you would like to have the latest edition delivered to your door then JOIN MAG by following the link above!! 13/04/2011 Fancy a Free Fun & Frolics on the Fylde? This year, the Fun Folk from Blackpool Area MAG are looking for willing volunteers to help marshal the Fantastically Famous Fun & Frolics on the Fylde Rally. As a mark of their appreciation, they are offering a Full Fun & Frolics ticket refund for a mere eight hours duty and a Free Fun & Frolics T-shir for those that clock up twelve or more! If this was not reward enough, all Fun & Frolics marshals will be entitled to Free Food for the hours they work. If you think you may be able to help out, pleaseCLICK HERE to download an application form, or phone; 0844-2480169 for further details. 20/03/2011- Blackpool MAG Rally tickets on sale via post or on-line !! It was warming to see so many members from around the region turning out on such a wet & windy day to show their respect for a man who died fighting for our rights. Click HERE for Bill's report of the event. Wirral & Chester MAG are soon to re-launch with a rep many of you may remember from the past. Gordon Wheatcroft will be holding the first meeting on Wednesday February 2nd at The Crown pub, Conway Street, Birkenhead.CH41 6JE. The meetings are scheduled to take place on the first Wednesday of the month from then onwards. Contact details can be found on the “Local Groups” page. This year’s NW AGM was a resounding success with plenty in attendance and good lively discussions held. All Regional Officers were re-elected on block, although an appeal was put out for more members to get involvedat a local level. Many thanks to all who attended and thanks to “El Presidente ” for his witty words of wisdom to the attendees. This year’s Halloween Doo was the best yet. The night’s agenda included a round of Blackpool MAG’s infamous musical chairs, Maddy’s eating competition and a raffle with a selection of superb prizes which helped to raise plenty of money for MAG’s “fighting fund”. With performances from a young group of enthusiastic musicians, Scarred ID and fantastic sounds delivered from Fylde FM’s “Adam Bee” the party goers had a night to remember. Many thanks to all involved, and who was that doorman?? The Riders Are Voters campaign organisations have called for Mass Lobby of Parliament on Monday 8th November 2010. The Mass Lobby is not a street demo, it is a rare opportunity for riders from across the UK to gather at Parliament and tell the politicians how best they can serve the riding public. Taking part in the Mass Lobby is very easy and free of charge, but you must register your details with Riders Are Voters if you want to attend. You can register by Emailing central-office@mag-uk.org or Phoning the Riders Are Voters office on 0800 9883193 (rider registration is being co-ordinated by MAG on behalf of the RAV campaign organisations). 18/08/10- MAG raise cash for Afghan Heroes. Members of Blackpool MAG presenting cheque to Sandra Quine from the charity Afghan Heroes.In total, �600 was raised with activities at the summer rally and bike show at Stanley Park. Manchester MAG has moved to The Station Pub, Warrington Street Aston-Under-Lyne.OL6 6XB;every 1st and 3rd Tuesdays of the month at 7:30pm. The Annual Fred Hill Run took place this year on Sunday 14th February. The cold weather did not deter the hardy bunch of bikers who turned out on mass to pay their respect. Read Bill’s report in the reports section.